Loaded with healthy seeds and a generous scoop of whole wheat flour, this ridiculously easy, one-bowl, no-knead Seeded Focaccia Bread is also ridiculously delicious! I’d hate for you to think that this blog is getting a little seedy – but it’s actually true! Well hopefully, not in the sense of dictionary.com’s definition of seedy: “poorly kept; run-down; shabby”. But I have been playing with a lot of seeds lately. The house is a bit of quite a mess with those tiny little rascals rolling here, there and everywhere! But it’s been totally worth it. Once you take the first bite of this Ridiculously Easy Seeded Focaccia Bread I think you’ll agree. This focaccia bread recipe is modeled after my Ridiculously Easy Focaccia Bread (pictured below) that we posted this past summer. It was the one recipe I made over and over during the months we packed up our home and moved from Raleigh, NC to the mountains near Asheville. Why did I make this bread during such a crazy, busy time? Because this focaccia is so darn easy it almost makes itself (ridiculously easy) and we always had something good to eat! The recipe seemed to go viral on Pinterest almost immediately and now, 5 months later, it has over 78,000 pins and over 100 5-star reviews from readers who have tried it. Because this focaccia bread recipe is such a staple around here and because our readers have loved it so much, I’ve been toying around with a little healthier version. It’s taken some experimentation (hence my house looking like a seed factory) but I think this Ridiculously Easy Seeded Focaccia Bread is just right now. I’m hoping you love it as much as we do! What does Ridiculously Easy Mean? It’s also one that produces fabulous, super delicious results, ie, results that “appear” to have taken lots of time, talent, prowess and/or hard work. Ridiculously easy recipes have to work well on those busy days when time is short and expectations are high. And last, ridiculously easy recipes are perfect for entertaining, mostly because of the first two characteristics. They take the stress out of dinner parties as well as gatherings of families and/or friends and allow you more time to enjoy your people. This Ridiculously Easy Seeded Focaccia Bread ticks all the boxes above and more! It’s also decently healthy with a load of wonderful nutritious seeds. Although many of them are super tiny, these seeds are loaded with powerful health benefits. They’re linked to improved cardiovascular, digestive, immune and bone health and there have been studies showing that regular consumption of seeds may contribute to the management of blood sugar. Seeds also can help control appetite, increase bone density and lower the risk for obesity and certain cancers. Wow, we all might need a little seedier life! Like the original Ridiculously Easy Focaccia recipe, this easy seeded focaccia has a relatively small amount of oil compared to classic focaccia. 2 tablespoons per 8-inch round loaf is way less than the amount you’ll find in most recipes. The most popular focaccia recipe online (according to Google) calls for a CUP of oil! I say this focaccia has “a generous portion of whole wheat flour” because it’s not 100% whole wheat. If you’re looking for that you might want to check on a different recipe. I did substitute 1 cup of the all-purpose flour for whole wheat flour. The whole wheat flour, along with the nutritious seeds definitely adds more nutritional value to the recipe, while still being light, delicious and strewn with those classic Italian focaccia “tunnels” of air. I really like the White Whole Wheat flour made by King Arthur. It’s made from the whole grain and has the same nutritional value as whole wheat flour, but it’s lighter in color and milder in flavor – a win-win! You can find King Arthur White Whole Wheat Flour at most larger grocery stores, as well as big box stores like Target and Walmart. The technique for this Ridiculously Easy Seeded Focaccia Bread is similar to the original focaccia recipe; stir together flour, salt and yeast then add warm water and stir until combined. Refrigerate overnight for a long, slow rise. The next day, divide the dough in two and let it rise again in the pans. Bake, but be prepared for a crazy delicious aroma! Try to let it cool, then cut a thick slice and spread it with butter. You know what to do next, right? I love to cut this Ridiculously Easy Seeded Focaccia Bread into long slices, add a bit of olive oil to a sauté pan and cook the bread over medium heat until golden and crisp. We also enjoy these crisp slices with salads, soups and entreés. This focaccia also makes a wonderful sandwich bread when cut into pie-shaped wedges and sliced horizontally. Have I convinced you? Please try this wonderful, super easy… ridiculously easy seeded focaccia bread, asap! I think it will become a favorite with your family/friends too! Stay tuned for a delicious new soup recipe, our Instant Pot/Oven Pasta Beef Soup – coming up! You can find King Arthur Whole Wheat White flour at most larger grocery stores and at big box stores like Target and Walmart. I use one of these Danish Whisks to easily mix up my dough. They’re inexpensive and make whipping up any dough super simple. You can cut this easy seeded focaccia bread into wedges or crossways, into strips. I love cutting it in strips, crisping it up in a pan with a drizzle of olive oil and serving it with soup and salads. Just brush the cut sides of the bread lightly with olive oil then heat a non-stick pan over medium heat. Add the bread and cook on both sides until golden. Delish! Be sure to grease your pan and line with parchment paper. I LOVE these pre-cut parchment rounds. They make my focaccia-making life a breeze! This recipe calls for Instant Yeast which is also called Rapid Rise Yeast. You can find Instant or Rapid Rise Yeast at most grocery stores, right next to the regular yeast or online. You can also buy it in bulk and store it indefinitely in the freezer. It’s infinitely cheaper buying yeast in bulk vs purchasing it in the little packets. 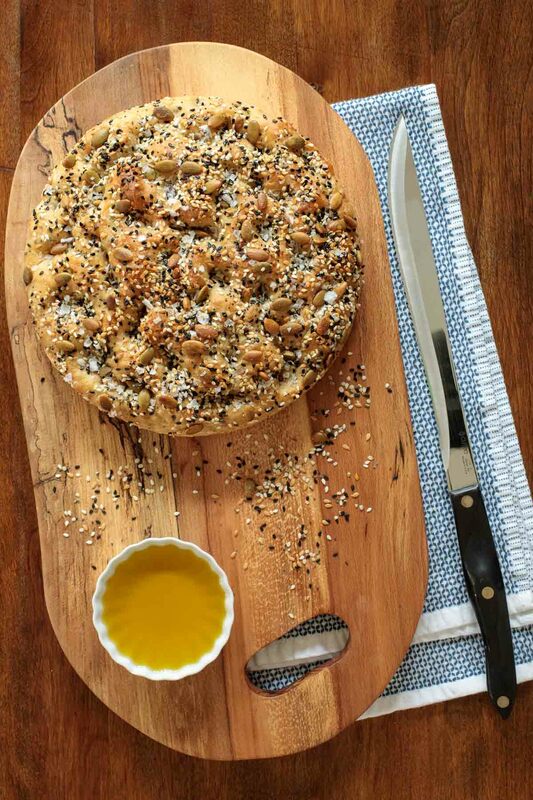 Don’t worry about exact rising time with this easy seeded focaccia bread. I have done as little as eight hours and as much as 24. Your results will be wonderful as long as it rises at least 8 hours. The second rise (in the pan) should be at least 2 hours unless your kitchen is really warm. In this case, it may be a bit shorter. The dough should be close to filling the pan. Once you make the “dimples” and add the seeds, give the dough about 30 minutes to settle and rise a little in the pan before baking. This is an extra step that’s not necessary with the original focaccia recipe but, with the seeds and WW flour, this extra time gives the bread a nice, light texture. Don’t be shy when you “dimple” the dough, just before baking. You want to poke your fingers in all the way to the bottom of the pan and actually make little holes with your fingers. This will ensure nice deep dimples that won’t disappear in the oven. Look for a flaky sea salt to top this bread. It gives a nice little crunch and a pretty presentation. I love Maldon. It’s more expensive than kosher or regular salt, but a box will go a long way. Use it as a “finishing” salt – just rub a pinch of it between your fingers over food to give a fabulous looking final touch. Use any seed mixture you want. Sometimes I’ll vary the amounts of seeds and/or swap out one for another. You’ll want a total of about 1/2 cup of seeds. Sometimes I substitute a tablespoon or two of quinoa or chia seeds for one of the others. Make it your own, use what you like. One caution on sunflower seeds. I love sunflower seeds, but have found that they get rancid quite quickly when stored at room temperature. Be sure to smell the seeds before using. You’ll be able to tell with one whiff whether they’re rancid or not. I bought some just a few days ago at a local health food store. When I got home and unpacked my groceries I discovered they had gone bad. So sad! If you like a thinner, crispier bread, use two 9-inch pans rather than the 8-inch pans. Loaded with healthy seeds and a generous scoop of whole wheat flour, this Ridiculously Easy Seeded Focaccia Bread is also ridiculously delicious! For the seed mixture, combine all seeds in a small bowl and stir well to combine. Set aside. In a medium-large bowl, combine both flours, salt, instant yeast and 1/4 cup of the seed mixture. Stir well. Add the warm water. Using a Danish whisk, sturdy wooden spoon or sturdy rubber spatula, mix until all of the flour is incorporated and dough forms a ball. Scoot the dough over to one side of the bowl and drizzle a little olive oil into the bottom of the bowl. Turn the dough over in the bowl to coat thinly with oil. Cover the bowl with a plastic wrap and refrigerate for at least 8 hours and up to 24 hours. Lightly butter two 8-inch cake pans. (You could also use 9-inch pans if you like a thinner, crispier bread.) Line pans with parchment paper. Pour one tablespoon of olive oil into the center of each pan and rub with your fingers to coat the bottom of the pan. Divide dough in half with a large spoon or rubber spatula and place one piece of dough in each pan, turning to coat with oil. Tuck edges of dough underneath to form a rough ball. Cover each pan tightly with plastic wrap and allow the dough balls to rest for 2 hours or until the dough almost covers the bottom of the pans. Drizzle another tablespoon of oil over each round of dough. With oiled fingers, using both hands, press straight down and create deep dimples that go all the way through the dough (in other words, you'll actually be making deep holes.) If necessary, gently stretch the dough as you dimple to allow the dough to fill the pan. Sprinkle the remaining seeds over the tops of the dough in the two pans. Sprinkle each pan generously with flaky sea salt. Cover with a clean towel and allow pans to rest on the stovetop while the oven is preheating. Preheat oven to 450˚F. After dough has rested for 30 minutes, transfer the pans to the oven and immediately reduce the temperature to 425˚F. Bake for 18 to 24 minutes, until the tops are golden and the undersides are crisp. Remove pans from the oven. With a metal spatula remove bread rounds from the pans and transfer to a cooling rack. Serve warm or allow to cool completely then store in a zippered bag. Freeze: To freeze, allow bread to cool completely, then transfer to a ziplock bag and freeze. Thaw and enjoy at room temperature or warm for 10 minutes in a 350˚F oven. See Café Tips above for additional instructions and more detailed tips. Thanks so much, George! So happy you enjoyed it! I didn’t have whole wheat flour so I just used plain flour and half a teaspoon of bread improver. It worked well and was delicious! Thanks for sharing your results, Kathryn! I have made the focaccia bread twice now with great success. Could I use the same recipe (sans seeds) for pizza dough? A beginner baker here! I tried this recipe out because of the “ridiculously easy” attached to it, and honestly, I found it quite easy. I only had whole wheat flour at home and I couldn’t wait to try this recipe so that’s what I used. The 2 cups of water weren’t enough, I guess it was because I was using whole wheat flour. I also ended up kneading it. I also didn’t let it rise again after dividing it into two pans. And I had to bake it for almost an hour for it to cook through completely, but I was pretty liberal with the recipe so that was probably my fault. I loved the texture of the bread, inside and out. The seed combination was perfect and delicious. For the salt, I decided to use Hawaiian sea salt, which is nice and coarse, and that worked amazingly. Overall, the recipe was amazing, I would definitely try it again (and this time, I would stick to the instructions!). Thanks Chris! Thanks so much, Areej, for sharing your results! It’s good to know how adaptable this recipe is 🙂 I’m so happy you enjoyed it and would love to also hear your review next time you make it. I know it seems like it should be “kneaded” but do try it without kneading. It will be a wet dough but it works and it’s so easy that way! Thanks again! I love homemade focaccia and this looks absolutely perfect! Getting back to you… Yes, I had added 1/4 cup flour to the what I perceived to be an extremely wet dough. As you said, it wasn’t needed. The bread baked up wonderfully. Even after a 30-hour proof. Baked 1/2 of the batch in a 10″ cast iron skillet. The loaf was a bit thinner, but I enjoyed the chewy texture of this loaf more than the loaf in the 8″ cake pan. Drizzled more olive oil during the dimpling process. This is an easy and very flavorful bread to make. I highly recommend it! Thank you for sharing the recipe. Thanks so much, Annamarie, for sharing your results! So happy you enjoyed it! Like you, I find this bread to be very forgiving regarding rising time and the size of the pans can be varied, depending on how thin or thick you like your focaccia. Trying this recipe for the first time. Is this a really wet dough? I added 1/4 cup flour as it seemed excessively wet. It still seems more like a thick batter than a dough. I’m accustomed to making “no knead” on a daily basis for my catering company and that is also a fairly loose dough. Just thought I’d check in. It is a wet dough. Don’t add more flour. I know it’s different than most bread, even other no-knead recipes – but it works so well!! I think the wet dough is what helps ensure the classic Italian texture with the nice big holes! What a delicious treat Chris! I’ve never had a focaccia with seeds before – love the idea! Easy works for me too 🙂 Pinned! I absolutely adore focaccia Chris! And what an awesome idea to top it with all the yummy seeds! My favorite. Can’t wait to give your recipe a try! Looks so good and perfect with a bowl of steaming hot soup! I am wondering if you have ever tried making this as one big loaf. I usually make focaccia in a half sheet pan and it seems like it would be the correct ratio. Looks delicious! I love, love seedy breads, especially one that’s so easy to prepare! Slices would be so good with all the soups and stews I make during the winter! Can I half the recipe? Hi Peggy, you could definitely half the recipe although this bread does freeze really nicely and it’s wonderful to have a loaf stashed in the freezer! Enjoy! !